Get the details on important landmarks, attractions and resources for your trip to Florence. An unusual enclave of entertainment that entitles members to enjoy a club-like atmosphere in which to be wined, dined and entertained. A 2,000-seat auditorium with an orchestra, choir and dance company that performs throughout the year. The former refectory of the unique Church of Santo Spirito is noteworthy for its "Last Supper" fresco. Part of the Pitti Palace, this museum celebrates 150 years of Italian painting, the majority of which focuses on Tuscan artists. Not far from the Duomo, this popular museum houses a vast collection of Florentine paintings and unfinished works by Michelangelo. It is also shrine to his powerful, lifelike statue of David. The world's largest collection of Italian art, the Uffizi is home to early works by Giotto and Cimabue, masterpieces by Raphael, Caravaggio, Tiepolo, Titian and the wildly popular Birth of Venus by Botticelli. The Galleria Palatina, the main museum in the Pitti Palace, showcases not only Italian masters such as Raphael and Titian but also Flemish and Spanish painting. Part of the Church of San Lorenzo, the Medici Chapels are a unique mix of stone and marble, designed by Michelangelo and containing the richly decorated tombs of the Medici family. An annex of the Church of Santa Croce containing artistic treasures that were once found in the wood-beamed basilica. Discover more about the Cathedral of Santa Maria del Fiore by visiting The Museum of the Opera del Duomo, which houses a collection of the beautiful sculptures that once adorned the Duomo. One of Italy's most famous contemporary sculptors, Marino Marini, is honored here in a handsomely renovated former church. Opened in October 2006 and located in the Piazza Santa Maria Novella, the museum is dedicated to the history and technological evolution of photography. The national museum possesses a spectacular selection of sculptures spanning three centuries including several statues by Michelangelo and an entire gallery dedicated to Donatello and his bronze statue of David. This gigantic stone palace, whose pure Renaissance design can be attributed to the school of Brunelleschi, belonged to the Medici family who took up official residence here in 1550. Today the palace is an unconventional and fascinating amalgam of museums containing eclectic collections belonging to various members of the Medici family throughout the ages. Displays silver but also other types of jewels, most of which belonged personally to the Medici. Designed by architect Michelozzo in the mid 15th century, the palace represents typical Florentine Renaissance architecture and contains a rich collection of art including the exceptionally frescoed Chapel of the Magi. 15th-century palace and cultural center that represents the epitome of Italian Renaissance architecture. 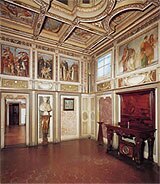 Private residence of Cosimo dei Medici in the 16th century, the luxuriously decorated palace boasts fine fresco work, including a series by Vasari that celebrates the ruling Medici and the city of Florence. Purchased by the Medici in 1550 and slowly transformed over the years with the addition of architectural landscaping, statuary, and ponds, the Boboli Gardens are known worldwide for the large grotto designed by Bernardo Buontalenti. The former home of Michelangelo is now a pleasant small museum containing several noteworthy works by its legendary former proprietor, including a wooden crucifix and two bas-relief statues. This charming little house where Dante is said to have been born in 1265 is now a museum containing several editions of the author's poetic masterpiece, The Divine Comedy. A popular cooking school that offers Tuscan cookery classes that include tasting tours of local food markets. A fashion outlet shopping center with designer boutiques that include Bottega Veneta, Ungaro, Zegna, Gucci, Hogan, La Perla, Loro Piana, Ferragamo, Rossi, Tod's and Valentino.